Danny Lewis scores inside early in the game against Lebanon. 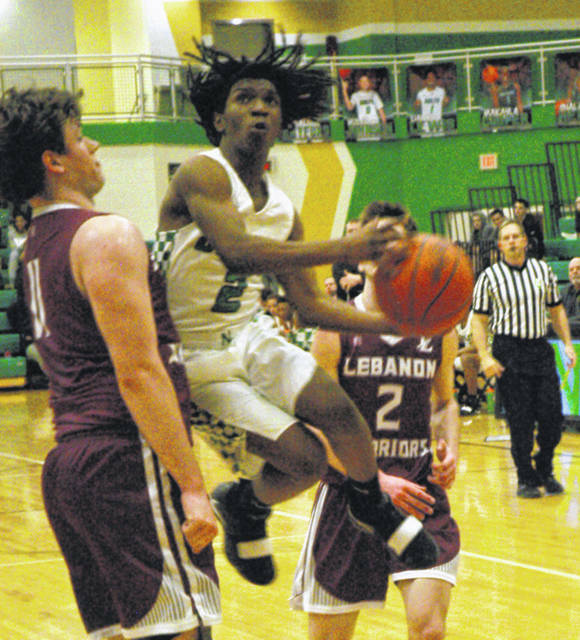 Lewis led Northmont with 27 points. Di’talian Rayford leaps past Lebanon’s 6-foot-5 forward Zach Huffman to score during the first quarter. Miles Johnson launches one of a trio of 3-point field goals he scored during the first half Tuesday night. Patrick Ivory (13 points) drives past Lebanon defender Milo White. Justin Golson stumbles but quickly recovers as Blake Lamb applies defensive pressure. 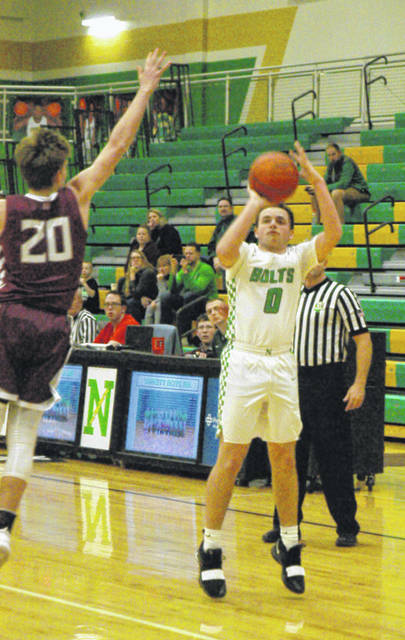 CLAYTON — Northmont buried four 3-pointers during the first quarter Tuesday night to take a 22-12 lead against Lebanon and went up 27-12 early in the second quarter before the Warriors started to regroup. Danny Lewis and Miles Johnson both knocked down a pair of treys in the first quarter that saw the Thunderbolts explode out of the gate to take a 16-4 advantage. Zach Huffman, a 6-foot-5 senior forward, kept Lebanon in the game by scoring 10 points in the first quarter and seven in the second. The Thunderbolts defensive pressure was relentless resulting in a pair of first quarter steals. Lewis, who led Northmont with 27 points, came up with a steal on an inbounds pass underneath the basket for a score to help maintain a nine point lead 33-24. Huffman countered with a basket and a steal that he converted into another basket. Nick Lang and Nick Pierett each scored five second quarter points and Milo White scored two as the Warriors managed to pull within 38-31 at halftime. The third quarter saw the Warriors outscore the Thunderbolts 20-13 to tie the game 51-51 entering the fourth quarter. That momentum carried over into the final eight minutes as Lebanon went on to post a 73-65 victory. Huffman stepped up to score 11 in the fourth quarter to finish the night with a career-high 32 points to lead Lebanon to victory. With the game tied entering the fourth quarter the Thunderbolts appeared ready to reestablish control of the game. Lewis came up with a steal and Justin Golson scored and drew a foul from White. He buried the bonus shot for a 54-51 advantage. Lewis came up with another steal underneath the hoop and scored to boost the lead to 56-51. 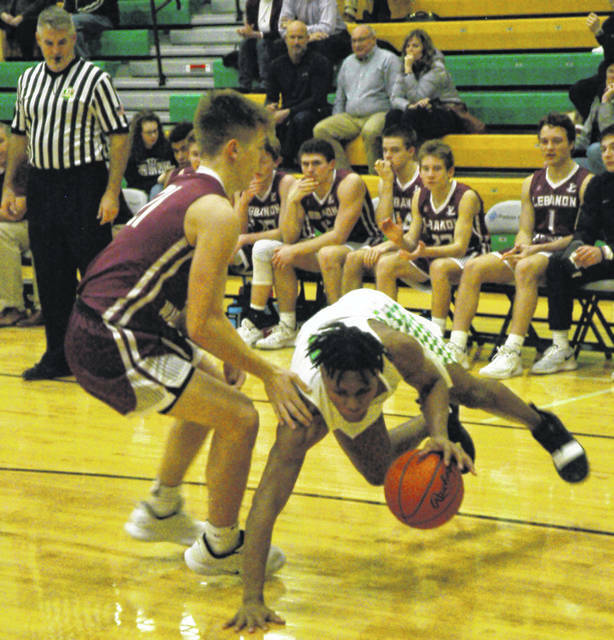 Lewis later drew a foul, sank one of two free throws and scored another bucket to give Northmont a 59-53 lead, but after that the momentum began to change. A basket by Zach Weber and back-to-back buckets by Huffman tied the game 59-59. 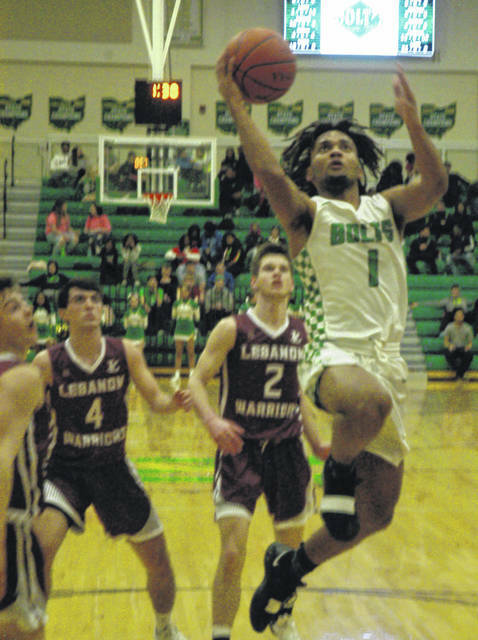 After Lebanon got called for traveling Lewis put Northmont up by two but the Warriors went on a 7-0 run to take a 68-61 lead with 1:01 remaining. With 38 seconds left Patrick Ivory buried a 3-pointer to cut the deficit to 69-65, but those were the last points Northmont could muster. Pierett sank a pair of free throws and Huffman scored inside as Lebanon secured the eight point win. The rebounds were fairly even with Lebanon snaring 32 to Northmont’s 31. 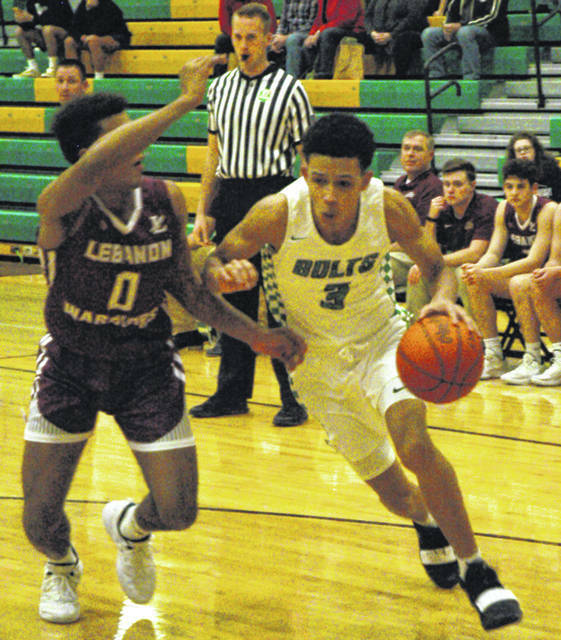 The Bolts had 10 steals to Lebanon’s nine and Northmont committed 11 turnovers compared to 15 by the Warriors, but the pair of turnovers the Thunderbolts committed late in the game proved costly. Overall Northmont competed well and caught Lebanon flat footed early. Kincer was happy with his team’s aggressiveness and how well they competed. Lebanon: Milo White 4-0-8, Sammy Stotts 3-4-12, Nick Lang 2-0-5, Zach Weber 1-0-2, Zach Huffman 14-1-32, Alex Martin 2-0-4, Nick Pierett 2-5-10. Totals: 28-10-73. Northmont: Miles Johnson 3-0-9, Danny Lewis 11-2-27, Di’talian Rayford 2-2-6, Patrick Ivory 4-2-13, Justin Golson 3-3-9, Jordan Smith 1-0-2. Totals: 24-9-65. 3-point goals: Lebanon 7 (Huffman 3, Stotts 2, Lang, Pierett); Northmont 8 (M. Johnson 3, Lewis 3, Ivory 2). Records: Lebanon 8-10 (5-4), Northmont 5-12 (1-8).